Listen to "12 Rules For Life By Jordan Peterson: Key Takeaways, Summary & Analysis Included" on your iOS and Android device. Learn how you can apply the main lessons & principles from 12 Rules For Life in a quick, easy listen!Throughout the years, former Harvard and current University of Toronto professor and clinical therapist Dr. Jordan B. Peterson has created what he accepts to be a conclusive arrangement of standards for living a fruitful and satisfying life. 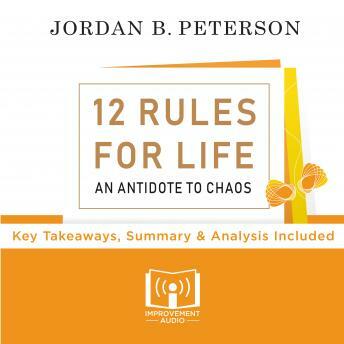 From an initial list of 40 rules, Peterson has worked to condense them into a thoroughly considered, reasonable rundown of 12 rules that he shares in this book. He has a depth of refreshing honesty. He believes firmly in telling the truth, human order, and sexual health. He trusts that pain is an unavoidable part of life and that individuals include it inside themselves to make a order out of chaos. It's likewise important this is a forceful, in-your-confront sort of Self-Help book - one which he bundles and displays as the convergence of old intelligence and logical research. A significant part of the old insight appears to originate from religious sacred writing, while the logical research fills in as an approach to reinforcement the convictions the writer holds precious to him. In any case, whether you think about yourself religious, un-religious, or someplace in the middle of, this is an intense book that can enable you to build a higher feeling of self-restraint and confidence. This book is a ground-breaking effect of continually coming clean-regardless of what could happen. This audio captures the key takeaways found in the original book. All fluff and unnecessary information has been removed to save you hours of time. If you've already read the original, this audio will help you cement the most important lessons. If you haven't, don't worry, here you will find all the practical information that you can apply. However, we do encourage you to purchase the original as well for a more comprehensive understanding of the subject. Wow, what garbage. I thought this was the book. It turns out it isn't and this is garbage.